On a recent morning, my 5-year-old daughter, Claire, drew a picture of herself with an elaborate Princess Leia hairstyle, wearing a blue gown and riding in a large, wooden boat. The front of the boat was tricked out with cupholders for two icy beverages, both of which had little umbrellas in them. On the other side of the boat (next to another pair of drinks) sat Luke Skywalker, unrecognizable if not for the light saber on his belt and “Lewk” written above him with an arrow pointing to his head. In a bundle on the floor of the boat was a tiny, faceless baby with an arrow indicating this was actually Claire’s long-since-unswaddled 3-year-old sister, Ivy. For all the depicted touchstones of the artist’s passions and priorities (fanciness, refreshing beverages), the picture demonstrates a vehement disregard — a hostility, even — toward reality. Claire’s hair isn’t long enough to braid elaborately, she’s never met Luke Skywalker, her little sister is three feet tall now, and the one time Claire rode on a boat, she cried and begged to return to land. For her to be placed in the situation she’s depicted, something must have gone horribly wrong in the world. Mommy and Daddy are lost or dead, her little sister has regressed dramatically in the wake of a significant trauma, the globe is covered in water, and the only suitable mate is an orphan with anger issues, draped in visible weaponry. But sometimes an apocalypse is required for the world to get in line with your fantasies. Which at least partially explains why so many apocalyptic tales these days seem to be driven by such heavy doses of wishful thinking. Take the sugary, armageddon-flavored nuggets of NBC’s new doomsday hit Revolution. Unlike the cautionary tales scripted by futuristic visionaries like George Orwell or JG Ballard, Revolution feels like a child’s clumsily drawn daydream, one that lands halfway between Dungeons and Dragons and Real Simple magazine. After all the lights go out across the globe (and batteries and gas-powered cars stop working, too, somewhat nonsensically), citizens abandon their gadget-driven, soulless existences to sharpen machetes, grow sustainable crops, and engage in mixed martial arts combat. Even the show’s CGI images of weed-strewn urban landscapes go from haunting to oddly soothing in a matter of seconds, as flocks of birds fly through the sky and serene agrarian societies spring up in the cul-de-sacs of suburban neighborhoods. The apocalypse depicted in Revolution corrects a myriad of modern injustices, from laziness to sloppy living to overindulgence; it’s soon clear that for all the heroes’ battles with evil soldiers and bandits patrolling the land, it’s the pre-blackout fast-paced, materialistic, digitally fixated society that represents the real dystopia. Thanks to worldwide catastrophe, TV- and iPhone-hypnotized children morph into capable, imaginative teenagers hunting and gathering to their hearts’ contents, echoing the pastoral reveries of The Hunger Games. Millionaire Google executives are reduced to awkward, cowardly geeks who stoop over to catch their breath every few minutes. The injustice of high-tech, remote-control weaponry is supplanted by the much more egalitarian rigors of hand-to-hand combat. Best of all, the handsome, well-muscled teenager started out as our damsel in distress, thanks to his dependence on asthma inhalers. As he sighed and pouted in captivity for the first few episodes, his more able-bodied older sister colluded with a loosely knit band of rebel forces to overthrow the local militia. Throw in some fancy braids and fruity cocktails and you’ve got an apocalypse worth daydreaming about. It’s hard not to feel a rush of yearning for this simple if violent existence. The characters’ goals are concrete and simple: hit the road in search of help or information; subvert your malevolent overlords — local, observable foes, as opposed to the faceless, splintered, omnipresent enemies we increasingly protest; hide your firearms and your American flags from evil outside forces. Even romance is more straightforward. Instead of texting with our heroine, a handsome cross-bow-wielding stranger saves her life by sticking an arrow in her assailant’s chest — a move that’s not only more direct than a winking emoticon, but also reflects favorably on his adaptive traits at a time when these things clearly matter. The writers of Revolution may be taking style cues from AMC’s zombie apocalypse hit The Walking Dead, a heady mix of horror flick and soap opera that somehow milks the maximum melodrama out of each scene without losing its nostalgic undertones. Although the dirty work of slicing up zombies might be less plucky and delightful than the high-fiving Mickey Mouse Club patriotism depicted on Revolution, the escape fantasy is roughly the same. Last season the show’s filthy survivors stumbled upon — what else? — a gorgeous old farmhouse, the likes of which can be found in Looper and Signs and countless other films intent on toying with our idealized notions about the romantic comforts of the heartland. What better place for our heroes to restore their strength, reassert their core values — hell, even fall in love with a farmer’s daughter? They finally had time to make and eat big meals, do chores, and discuss unwanted pregnancies and conflicting parenting styles. The whole thing started to feel like a particularly gritty, new-age family retreat, led by a gaggle of temperamental gurus. The show’s third season relocated the survivors to the bleak confines of a prison, yet in some ways life became even simpler. Our murderous hero, Rick, adopted a dictatorial style of leadership, repeatedly asserting that democracy doesn’t work under such conditions. This frees his weary charges to follow him blindly, chopping off zombie heads and assisting in errands upon command, no longer burdened by the conflicted bewilderment inherent to thinking for yourself as the world crumbles around you. Meanwhile, Rick’s wife Lori went from questioning his judgment to apologizing for being a bad wife to sacrificing herself for the sake of their baby. What could simplify life more completely than replacing all of Lori’s moodiness and tough questions with the straightforward, sentimental delights of an infant? 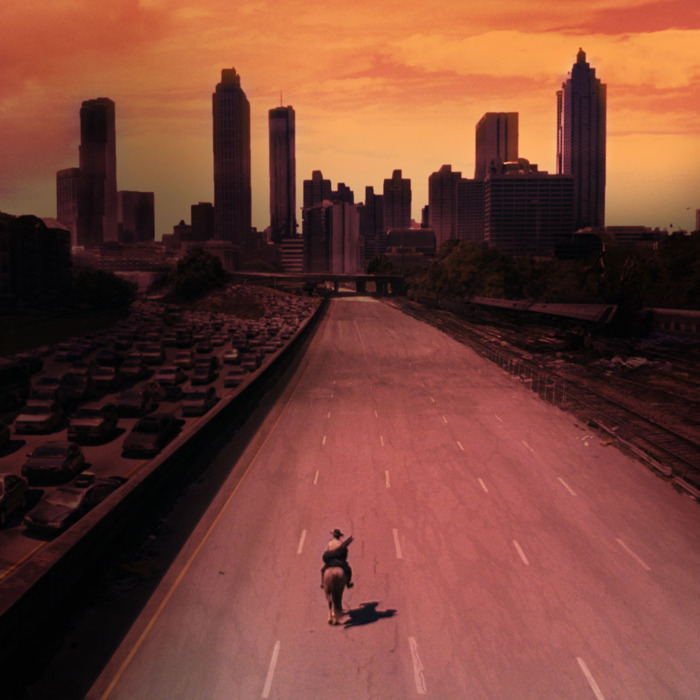 Throw in the neighboring totalitarian dystopia led by a heartless sexual predator who insists everyone call him “Governor,” and this season of The Walking Dead has played like a nostalgic fantasy of unquestioned patriarchal order. The authors of apocalyptic fiction also transform their worst-case scenarios into wish fulfillment, it’s just that their wishes tend to be a little more eclectic than most. In Zone One, Colson Whitehead empties New York City of its bustling crowds, leaving our protagonist to explore the streets and apartments and offices of the city unfettered — which sounds like something Whitehead, who’s written passionately about the city, would love to do. In The Dog Stars, Peter Heller places his protagonist against a calm, almost idyllic post-end-times landscape with access to his own plane and his own vast stretch of territory — the perfect scenario for an outdoor adventurer like Heller — then drops in an Amazonian female survivor like a care package from the Maxim gods. Cormac McCarthy’s The Road at first appears bereft of wishful thinking — that is, until you recognize that solitude and scorched horizons are this author’s ideal tromping ground. For McCarthy, the end times present the ultimate backdrop for contemplating mortality, far more eerie and unsettling than either the scrabbly West or the Appalachian wilds. Here, among the cannibals and the drifting ashes, his stark, biblical prose can take on divine proportions. The focus of these novels isn’t on the shape and form of the catastrophe; those details are often pretty vague. The apocalypse mostly serves as a way to turn up the contrast on a hero’s solitary battle to adapt and sally forth. Stripping away the complications and distractions of the modern world, what is our protagonist left with? The same melancholy and longing he or she always had, of course, but with far more of an excuse to feel these heavy emotions at every turn. Instead of injecting desperation, romance, solitude, and morbidity into a banal tale, these qualities are encoded in the apocalyptic novel’s DNA, minimizing the trivial clutter and heightening the stakes. Values and ideas about morality are stripped down to their essential nature: Kill or be killed? Conform and tolerate oppression or escape and risk death? Somehow, though, even in older works like Ballard’s The Drowned World, such disturbing questions are savored and relished. There’s an obvious delight taken in the awfulness of the transformed planet. In his survey of science fiction, A Billion Year Spree, Brian Aldiss refers to this tendency of authors to concoct enviable end times as “the cozy catastrophe.” As others suffer and die around him, our hero runs wild, enjoying the fruits of the worldwide holocaust. These characters rarely choose to join a large community and cooperate peacefully within its boundaries and bylaws for the common good. Because as long as it’s all fantasy, why subject yourself to the same compromises and restrictions you tolerate in your real life? What kind of an imaginative exercise is that? The species of author who favors an apocalypse isn’t typically interested in relating the adventures of an optimistic team player. They want to explore the possibility of even more curmudgeonly solitude and alienation and painful self-reflection than is accessible by other means. The irony is that, by altering the entire course of human history in their imaginations, they end up right back where they started in the gloom of their offices: Staring into the abyss alone, wondering what meaning our hero can possibly pull from the void. Revolution and The Walking Dead rarely dig that deep, of course. Compared to the authors of apocalyptic fiction, TV writers have much more in common with my daughter: They just want fast boats and fancy hairstyles and rookies armed to the teeth. While AMC’s hit veers into dark territory, the focus stays on building suspense (“Don’t touch him, he might’ve turned!” “Why is she out there, all alone?”), punctuated, alternately, by moments of gore and relief. Revolution, on the other hand, never quite overcomes the baby-proofed tone of most network dramas: The rebel isn’t all that menacing, the heroine’s hair always looks clean and fluffy, the bereft mom’s kids are still alive somewhere, back in England. This is the end times minus the gout or the rickets or even the chapped lips. Our militia leader has the Civil War–style tents but not the mud or the sawed-off limbs. This is the apocalypse with a full-time stylist, on heavy antibiotics. It’s an apocalypse we can happily play along with, in other words, one that goes nicely with our inflated notions about ourselves and our newfound interest in urban gardening and canning and composting. We can face an unknown future and pretend, for a moment, that we won’t be reduced to hysterics at the first hint of a sinus infection, or the first realization that the pool can’t be filtered for drinking water like we always imagined. When the end times roll around, you’ll find us sewing rag dolls from recycled jeans, crafting artisanal cheeses, or serenely sharpening our machetes by the fire. Isn’t it pretty to think so, anyway?